As your full-service paving company, Merit Asphalt can take care of your pavement for years to come. Our services range from driveway sealcoating to parking lot maintenance to help you protect your investment and maximize the life of your asphalt. Why Does My Asphalt Crack? There are many different reasons that asphalt cracks. Weather, proximity to trees, and the freeze/thaw cycle, are some of the factors that can cause cracking. Dry weather — Generally, most cracking occurs during periods of minimal rainfall and warm temperatures. The lack of moisture in the soil causes the ground to contract and separate. Visible cracks and gaps in a lawn are telltale signs that the soil is contracting. This shrinking of the soil occurs not only on the edges of pavement, but also underneath it. It is this movement which leads to the cracking of the asphalt. Trees/shrub — Asphalt pavement installed in close proximity to trees or shrubs is likely to crack. Root systems draw water out of the soil. During periods of low rainfall, this process causes ground movement which in turn results in cracking. Freeze/thaw cycles — The seasonal weather of Wisconsin puts a great deal of stress on pavements. 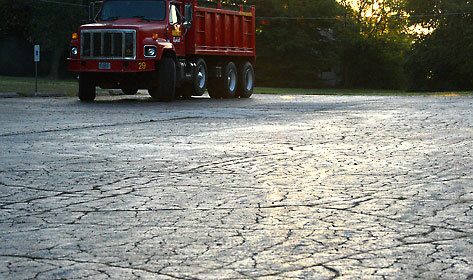 The freezing and thawing of the ground can cause the asphalt to rise and fall. This vertical movement sometimes results in cracking. An inadequate stone base or heavy traffic can also cause cracking. These conditions are caused by poor installation and poor design, rather than the natural factors listed above.